For anybody currently looking for a party bus in Wyandotte, then it is understandable that your search can be stressful. However, that search has now come to an end because here at Rockstarz Limousine and Party Bus, we specialize in providing our clients with the party to end all parties. 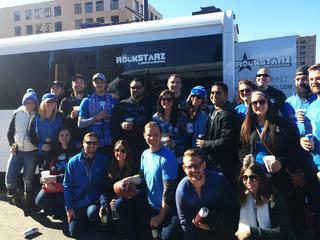 Our Wyandotte party bus rental options are designed to allow you to invite as many guests as possible to make sure that your party goes off with a bang. We have achieved this by making the maximum use of the space on the bus leading to us creating more room than ever before. Also, we have added leather seats to allow your guests to just take a break while the party carries on right before their very eyes. In addition, the first thing that you will notice with our Wyandotte party bus service is the interior of the party bus itself. We have worked hard to bring to you the perfect setting for the perfect party, and the design and equipment will make sure of that. From the state of the art sound system to the superb laser light display, you and your guests will rightfully feel as if you are in your very own nightclub as you cruise around listening to the music of your choosing. Previously, clients have used our services to help them to celebrate a number of different occasions. From a birthday to a special anniversary, as well as bachelor and bachelorette parties, we can cater for all kinds of occasions. Also, we are available even for those individuals that just want to have a party with their friends with no special reason and just seeking somewhere special. So, if you are a resident in the Wyandotte area and are looking for a party bus, then give us a call today at Rockstarz Limousine and Party Bus. Alternatively, you can contact us via our website and someone from our team will be in touch as soon as possible.